Remove brownies from pan and cut into small, bite-size cubes (about ¼”). In the bowl of an electric mixer fitted with the whisk attachment, add the heavy cream. Whip for about 30 seconds on high and then add the cream of tartar, vanilla and confectioners’ sugar. Continue to whip on high until stiff peaks form. Remove the lid to the Dark Chocolate Sea Salt Caramel Sauce and warm in the microwave for 1 minute, or until it is pourable. Line each jar with brownie bits so the bottom is covered and gently press down. Drizzle with 1-2 tablespoons Dark Chocolate Sea Salt Caramel Sauce. Top with ¼ cup whipped cream. 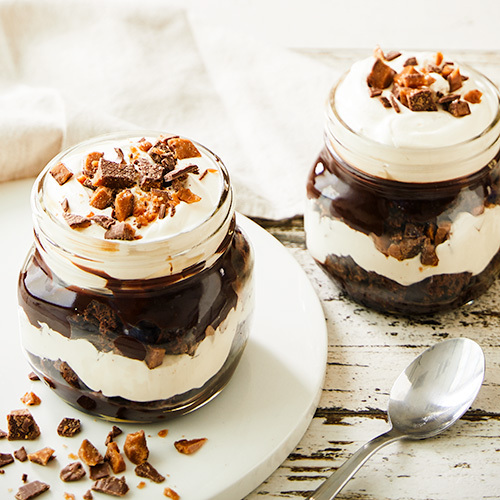 Repeat layers (brownie, sauce, whipped cream) until you have reached the tops of each jar. Serve chilled.